Here's a list of 15 fabulous graduation speech topics for inspiration, plus 5 handy tips on how to come up with your own ideas for what to include in your speech on the big day! 1. Express your gratitude to all the people who helped you through the years. That includes your family (especially your parents), friends, teachers, and anyone who encouraged or supported you in your studies. 2. Speak about at least 1 or 2 major accomplishments that your school or your class achieved during your time with them. 3. Use humor to keep your audience interested in what you're saying. Or take a quote and apply it to your classmates and what you've experienced together during your school years. 4. Look to the past and share stories of how things have changed since you started attending this school. Keep it upbeat and positive. 5. Throw in your own advice on how everyone should move forward now that you are all graduating. Come up with something that will inspire your classmates to look forward to their futures and let go of the past. 6. Decide on the overall message you want to impart. Choose something that relates to you and your audience. Will it be inspiring? Motivating? Funny? Interesting? Choose something that you feel comfortable with or feel strongly about. 7. Talk about someone who has inspired you. Give examples of how they've helped you to grow into the person you've become. 8. Pick a song that has meaning to you and use the words in it to express how you feel about graduating. Could be funny, for example, Pharrell Williams' song 'Happy' or it could be something uplifting like Justin Timberlake's 'Can’t Stop The Feeling'. 9. Choose someone in your class that has done something phenomenal and make it a point to praise them and thank them for showing everyone that obstacles can be overcome if you just put your mind to it. 10. Pick a teacher or faculty member that everyone looks up to and point out how they've helped you and your fellow students to excel. 11. Take the day that you are graduating and look back on historical events that happened on that day. If something interesting or funny happened, weave it into your speech. 12. Look back on the past years of your education. Did something major happen during those years? A big news story that affected you and your classmates? Speak about how you all dealt with it and helped each other out. 13. Talk to parents, students, teachers and anyone else you might think could help. Listen to what they say about what they would like to hear in your speech. It doesn't mean you have to use any of their suggestions but it might give you some ideas. 14. Keep your comments relevant to your school. Don't speak about stories or tell a joke that only your friends would understand. Remember you are talking to everyone in the audience. So come up with a great story that everyone can relate to, such as how all parents have something in common today. 15. And of course the last of the graduation speech topics tips is to make sure that you thank everyone for coming and to wish your fellow graduates the very best and brightest future. 1. Figure out what kind of speaker you are. Are you generally funny, serious, nervous, optimistic, pessimistic? Use your natural traits to guide you in writing your graduation speech. 2. You know who is going to be at the ceremony so ask them what they think might be some good graduation speech topics to talk about. Get a good sample of your audience members. Ask teachers, students, friends, family, faculty staff, etc. 3. Think back over the years of some of the stories that you've told about your school to other people. If you've repeated them a lot then they mean something to you. Use them in your speech. 4. Free associate. Write down the word graduation in a circle and then draw lines out to other circles. 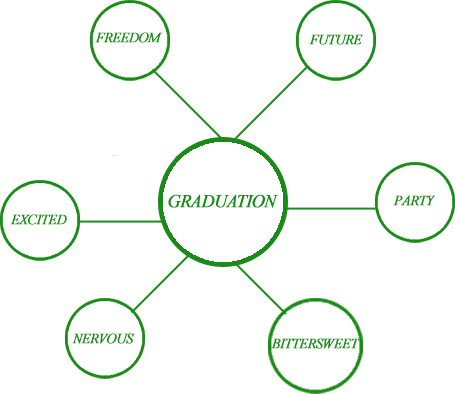 Put whatever words pop into your mind when you think of the word graduation in those circles and then expand on them by writing down a sentence or two of why they popped into your mind. 5. 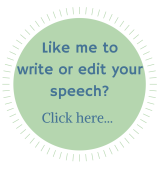 Use the search box below to check for other great graduation speech topics on the Internet! Being asked to make a graduation speech is an honor, although I do appreciate that it can also be daunting! I hope that you've found these graduation speech topics inspiring and they've helped you on your way to crafting a speech that everyone remembers!